If you know us at all, whether as individuals or as the mighty Cloudbakers team, you know that we love productivity. We're always interested in getting more accomplished with each click of the mouse, so when we find a tool that allows us to show off our skills, we can't help but get excited! One of our favorite tools for productivity is FlashPanel, a Google Admin Console replacement that expands on the functionality that Google provides by default. FlashPanel uses Google's own Admin APIs to get things done that you might not have known were possible. It does this while providing the full range of capabilities that are available in Google's own Admin Console. It's easy to get started with FlashPanel as an administrator; simply install it from the Google Apps Marketplace and sign in for the first time using their sign up form. At that point, you will be automatically signed in using your Google account and FlashPanel will begin syncing with your domain. This is where the real fun begins. Even before FlashPanel has synced with the domain, you have access to a whole range of tools that extend the Google APIs into easy-to-use workflows and powerful commands. You'll be able to see the Shared Contacts section that allows you to manage, edit, share, and browse the domain shared contacts. Email delegation is simple with the Delegation tool. Advanced reporting will allow you to manage your domain by aggregating the information you need, not hunting for the information you want. Quite possibly one of the most popular FlashPanel features, the Drive Explorer, takes a Google Admin Report and one-ups it. In the Google Admin Console, there is a very useful report for showing the number of Google Drive files that are shared with users outside of the domain. You can also run a report that will allow you to see the number of files each user is sharing externally. In FlashPanel, when you bring up this report, each metric is linked to their incredible Drive Explorer tool. This connection is an important one; it allows you to drill down into the number of files that are shared externally and see exactly which files are exposed! From here, FlashPanel will show you who owns that file, when it was modified, what the sharing settings are, and more. Let's say you find a sensitive document in the domain that is shared publicly. What can you do? What if the owner is on vacation and nobody can access that document to revoke public privileges? FlashPanel allows Admins to impose their own sharing settings on documents owned by the domain, effectively solving the issue. If that user is unreachable and a file needs to be protected from prying eyes, use FlashPanel to change the sharing settings. It's that easy. Don't feel like managing your domain's settings by fixing it after the fact? 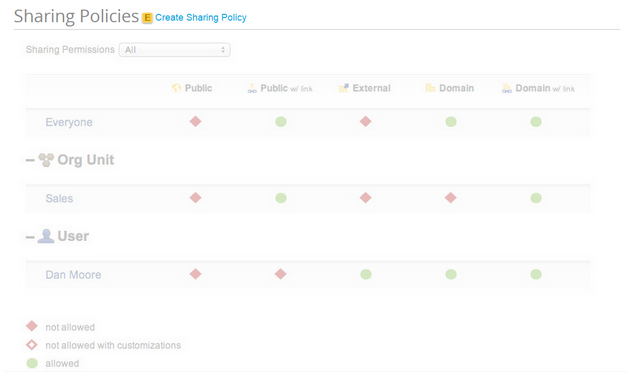 Certain versions of FlashPanel will allow you to set Drive Policies for enforcing sharing settings in real time. The next time someone shares something that violates your policy, FlashPanel will swoop in and correct the settings, notify the owner and any Admins, and protect your documents. FlashPanel has a huge list of features to explore, and we haven’t even scratched the surface. We can manage thousands of shared contacts within the domain, enforce company signatures, and even create custom workflows for adding users. We’re really excited about this tool, and you should be too. For those of you have have Gone Google, FlashPanel’s 5-star rating speaks for itself. For those of you who haven’t, why not?